With no food drives, supplies are running low. Summer’s a time of sun-splashed beaches, sailing, and fishing, but the need some families have to keep groceries in the cupboard doesn’t end just because there’s beach weather. This year the Island Food Pantry is trying to help meet those summer needs for the first time in years by offering summer hours on Wednesdays, Margaret Hannemann, program coordinator, said. Not only are there fewer food drives in the summer by organizations like school groups, Boy Scouts, and churches, but people aren’t putting as many donations in the purple boxes at Island grocery stores. “We knew we wouldn’t have supplies from food drives,” Ms. Hannemann said. “The funny thing is I was all excited because I thought we would get more donations because so there are many people around.” That hasn’t been the case. Ms. Hannemann, who took over for longtime coordinator Armen Hanjian, is trying to beef up donations by adding signs to the donation boxes. The food pantry uses money donations to buy the typical staples of pasta, sauces, mac and cheese, cereals, and other nonperishables, but they could also use other things, like cake mixes, crackers, popcorn, and the extras that help round out a grocery order. 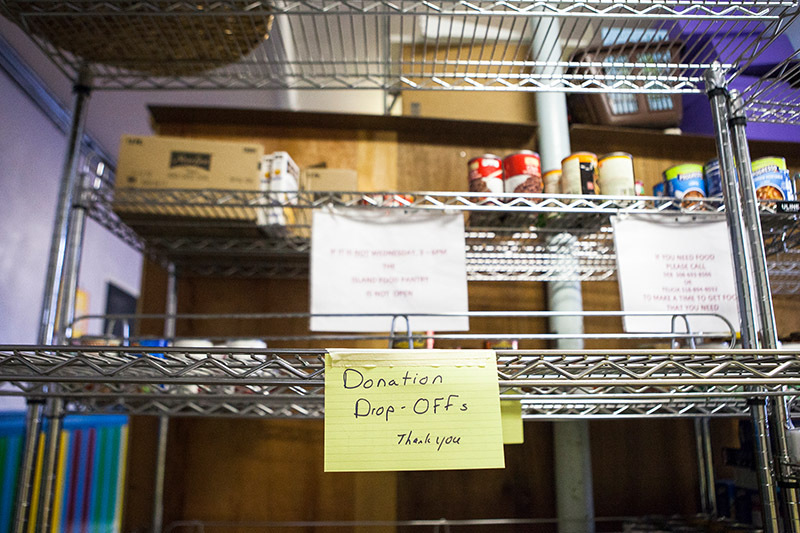 Clients who use the food pantry are typically referred by clergy, a social service organization, or a similar source. They are allowed to visit the pantry every two weeks, and are able to pack three bags of groceries selected from the grocery shelf of staples, produce obtained from the Island Grown Initiative, and the table of food from donation boxes and food drives. During the winter months, the need is greater, as some of the businesses close down and there are fewer jobs to go around. Last winter, the program served 423 clients, which represented nearly 1,000 people, Ms. Hannemann said. 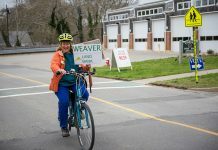 About one-third of the clients are from Vineyard Haven, a third from Oak Bluffs, and the rest from the remaining Island towns, she said. During the spring, the food pantry has been working with the gleaners from Island Grown Initiative, who have provided weekly selections of produce. At one point this spring, the pantry was stocked with 17 dozen duck eggs per week from GOOD Farm, Ms. Hannemann said. “Duck eggs come from the field pretty dirty, but we had a great team of five people who meticulously washed them for several hours each Wednesday morning,” she said. Leftover produce from the Island Grown Initiative’s mobile market is being sold to the pantry for distribution to its clients. Ms. Hannemann is hopeful that Island residents and visitors, once they know there is a need, will begin filling those boxes, which are located at local grocery stores, libraries, and real estate offices. 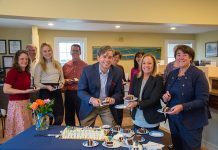 Money donations are always welcome, as well, for the staples the pantry buys for its shelves at Stone Church, 81 William St., Vineyard Haven. To make a cash donation, visit the Isandfoodpantry.org website or its Facebook page.